Carol McArdle was born in Jamaica but from age 3 grew up in Bristol, England. After high school she attended West Surrey College of Art and Design but left early to became mostly a self taught artist. In 1995 she moved to Southwest Florida and became an American citizen in 2001. Since Carol McArdle started her bold and colorful Natural Florida series of paintings in 2006 they have received much recognition and her work is in private and public collections around the world. 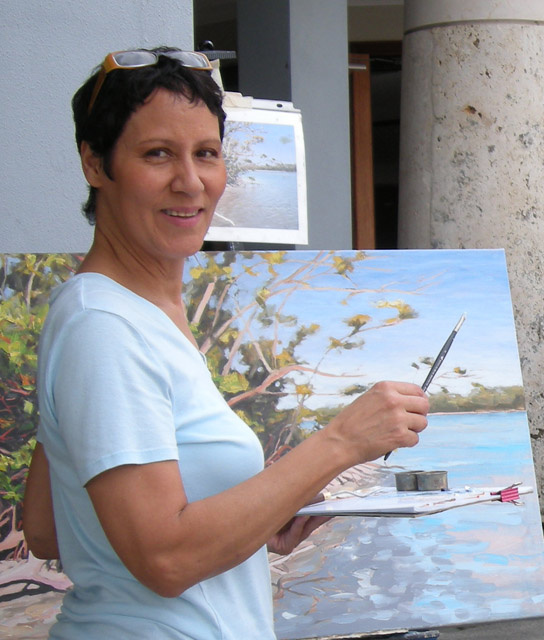 - Her being chosen to be the 2008 Resident Artist of Delnor Wiggins State Park, Naples, FL. - Being a finalist in the International Guild of Realism Annual Juried Exhibition, 2008. - Being juried into 2009 and 2010 prestigious "Birds in Art" at the Leigh Yawkey Woodson Art Museum, Wausau, WI. - Her paintings were in the 2009 "Paint America Top 200" and the 2009 "Paint the Parks Top 100" which went on tour for a year around the USA . - Her winning Best in Show at the September 2010 Fariplay, CO Plein Air Festival. - Her work being featured both inside and on the cover of many Florida publications, as well as the national art magazine, The American Art Collector. - Her being invited to hold many solos shows including two in museums. Carol continues to paint what she and her collectors love and want to remember about the beauty of State and National Parks, Preserves and other undisturbed areas of nature.